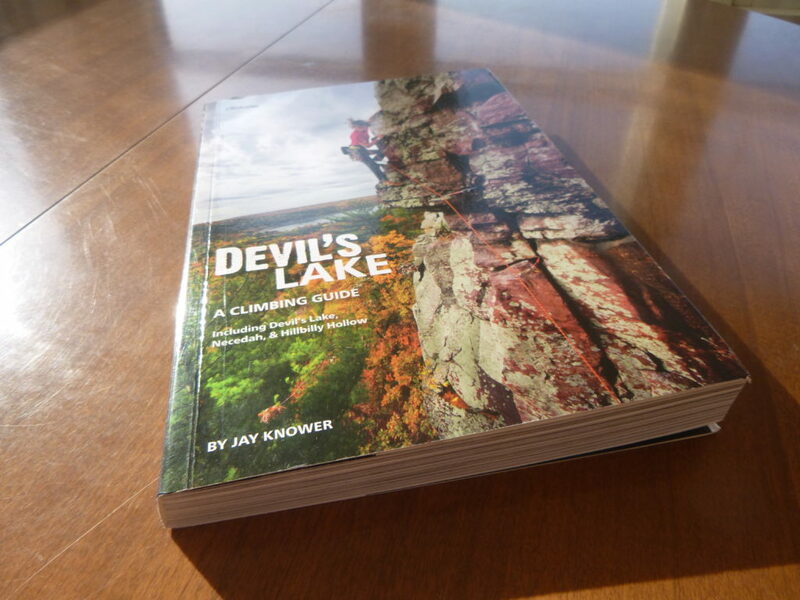 Devil’s Lake: A Climbing Guide by Jay Knower is a climbing guidebook covering Devil’s Lake as well as Necedah and Hillbilly Hollow, all climbing areas in Wisconsin. When I first heard about this guidebook I wondered why an additional guidebook was needed when there are already at least two guidebooks on Wisconsin climbing, Climber’s Guide to Devil’s Lake and Rock Climbing Minnesota and Wisconsin. Once I saw the book I knew that it brought something new to the table. Let me explain how the three guidebooks relate. 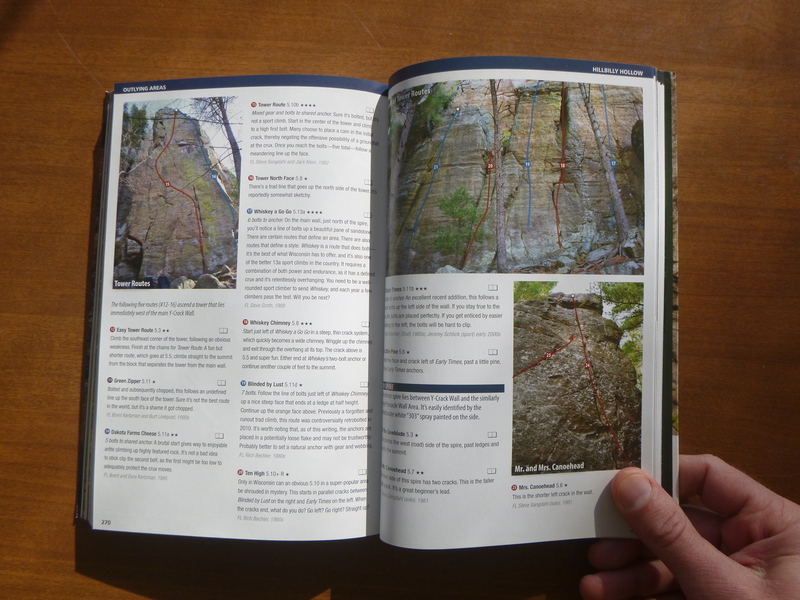 Climber’s Guide to Devil’s Lake is a classic, now in its third edition, and does a great job of detailing the more than 1600 routes at Devil’s Lake State Park. That said, Climber’s Guide doesn’t cover any of the other climbing areas in Wisconsin and is really a list without much in the way of route descriptions or pictures. It’s really a reference, not the sort of book you might read. Rock Climbing Minnesota and Wisconsin similarly only covers Devil’s Lake and covers only a small portion of the available routes. The rest of the book is about Minnesota climbing areas. It does have some nice pictures but still isn’t really in the modern style of guidebooks that are interesting to read. This is where Devil’s Lake: a Climbing Guide comes in. 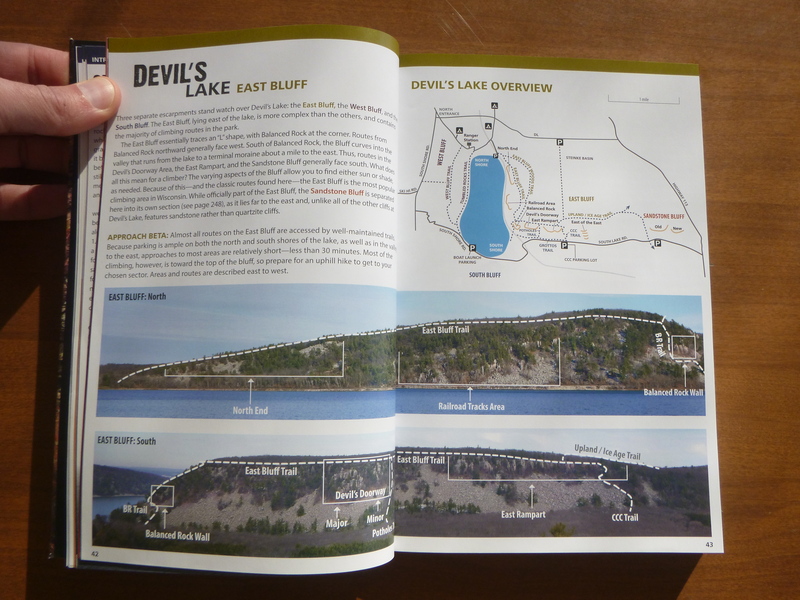 Devil’s Lake, in the style of many new climbing guidebooks, is fun to read. You can flip through it like a magazine, taking in the great photography and contemplating the interesting route descriptions. It even has some one-page short stories about Devil’s Lake climbing. This book serves equally well as a guide, reading material while riding in the car on Highway 12, and a coffee table book. The location and driving directions for Devil’s Lake, Necedah, and Hillbilly Hollow. Climbing history (including an ad for The DLFA, an excellent documentary on Wisconsin rock climbing in the 70s and 80s). 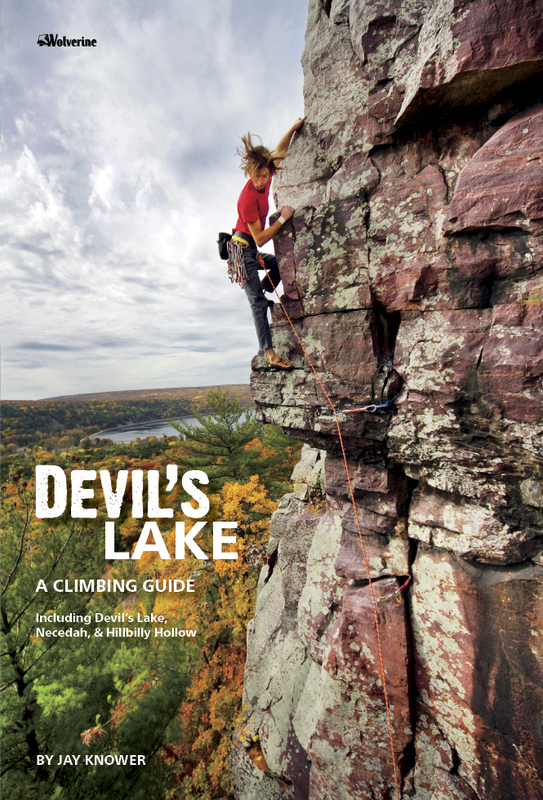 The outstanding Devil’s Lake: a Climbing Guide cover. All throughout the book there are excellent photographs along with detailed diagrams of areas and routes. 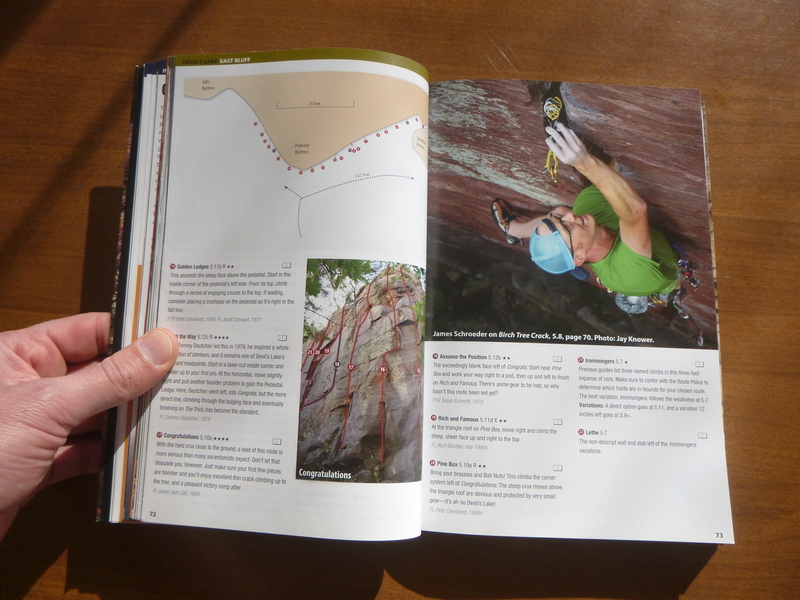 Most pages have a climbing photo, an overhead view, and an annotated picture of the routes in question. This James Schroeder guy shows up in the book a few times. Is he famous or something? If I was starting over and didn’t already have a guide to Devil’s Lake and didn’t know the area I would probably buy Devil’s Lake: A Climbing Guide first. I would make this choice because, although this book doesn’t cover all of the routes at The Lake (about 500 routes are included), the pictures and maps will really help climbers to find the area and the route that they are looking for in a way that Devil’s Lake: A Climbing Guide doesn’t. Later, I might also buy Climber’s Guide to Devil’s Lake so that I have information on the more obscure routes. A helpful map and annotated pictures to keep climbers from getting lost at Devil’s Lake. Devil’s Lake: A Climbing Guide also has an advantage since it includes nearly all of the routes at Necedah and Hillbilly Hollow, sandstone sport climbing areas not all that far from The Lake, as well as a small number of boulder problems at Devil’s Lake. For many, many more boulder problems see Mountain Project’s page on Devil’s Lake bouldering. Why Not Just Use Mountain Project? Finding routes at Devil’s Lake using Mountain Project is a pain because there are few landmarks to orient from, particularly on the West Bluff. Mountain Project doesn’t include a good way to find things in an area unless you already know that area. Also, many routes are missing. Finally, the Mountain Project route descriptions and pictures are often not good enough to distinguish one route from another since there is so much climbable rock and so many routes. If you really don’t want to buy a guidebook you can combine Mountain Project with talking to knowledgeable climbers but expect to waste a lot of time and get frustrated. There are a few drawbacks to Devil’s Lake: A Climbing Guide. The first is that one section of the book is mislabeled. At the top of each page is a color-coded bar with the name of the area on it. Both the Hillbilly Hollow and Necedah sections are labeled “Hillbilly Hollow”. A small error that can be easily worked around. Necedah routes labelled as Hillbilly Hollow. Another drawback to this book is that Governor Dodge is not included. There are about 20 sandstone sport routes there as well as about 300 boulder problems. It’s not that far from Devil’s Lake. A page or two could have been devoted to Qual Wall. Finally, The book is missing about 1000 routes at Devil’s Lake. I’m asking for too much here, but maybe someday we can get the quality of Devil’s Lake: A Climbing Guide combined with the completeness of Climber’s Guide to Devil’s Lake. I’m guessing this will be in an app or the book will have to be three inches thick and $100. In summary, if you are looking for a climbing guide to Devil’s Lake and other areas check out Devil’s Lake: A Climbing Guide.